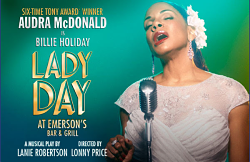 Today it was announced that Lady Day at Emerson’s Bar & Grill has been postponed as the show’s star Audra McDonald has announced that she and her husband, actor Will Swenson, are expecting a baby. The couple married in 2012. While this is their first child together, she is mother to a daughter, and he is father to two sons, from their previous marriages. Lady Day at Emerson’s Bar & Grill had been due to run at the West End’s Wyndham’s Theatre from 25th June to 3rd September 2016, with a press night on 5th July. Plans for revised dates will be announced soon.